Exterior masonry requires different paints and coatings than cladding or metal. Regardless of whether you are looking to waterproof, decorate or protect a substrate when picking a masonry paint, Rawlins Paints offer a wide selection of colours, covering both textured and smooth masonry finishes. If you require any recommendations, further product information or application advice for the smooth masonry paints listed in this category, please give us a call or drop us an email with your requirements. Waterproofing a property can be achieved quickly and successfully if adequate preparation work is done on the substrate or surface to be coated. If you are looking to cover and protect recent repair or renovation work, severe discolouration for water stains, exposure or a previously dark coating, choosing the right masonry coating is crucial. Smooth masonry paints, however, are ideal for a creamy smooth finish, which is easy to clean and maintain. As well as looking very aesthetically decorative, smooth masonry coatings can help protect the underlying substrate from weather extremities, mould, algae, moss and any other fungal growth. Application guides are available in datasheets that accompany each product, and Rawlins Paints’ blog has several articles about best practice application processes and improving building facades. 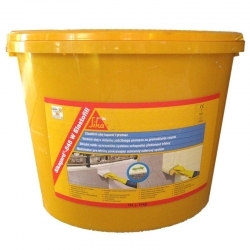 Sikagard 550 W Elastic is a crack bridging protective coating for concrete. Sikagard 550 W Elastic is a one component, plasto-elastic coating based on UV-curing acrylic dispersion with excellent crack-bridging properties even at temperatures below 0°C. Sikagard 550 W Elastic complies with the requirements of EN 1504-2 as protective coating. An exterior paint which produces a tough, durable finish with up to 15 years performance, designed to resist cracking, fading, peeling and blistering. It contains a biocide to protect the dried coating against fungal degradation.